Our main goal in digitising services is always to improve things for the customer – making a process simpler and quicker, and putting the customer more in control – but moving to digital has of course also meant we generate a lot less paper. World Paper Free Day feels like a good day to share some of our successes in this area! 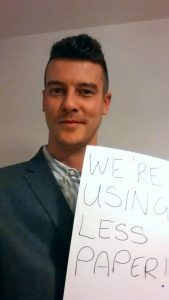 I’m Matt Donmall, Senior Project Manager for HMRC’s iForms work – a project that has put all of HMRC’s forms online and is now making them fully digital. Back in September 2013 HMRC had 1,600 paper forms in use. Last month, my team celebrated when we passed half a million online form submissions (in fact that figure is now 700,000). So how did we get from there to here? Well, when we started I have to say that 1,600 forms seemed like a crazy amount. Did we really need that many forms as an organisation? So we set ourselves the (rather daunting) task of rationalising the whole lot. By removing obsolete forms and amalgamating others, where it made sense to do so, we ended up with just 370 essential forms. Quite a reduction! The next step was to start digitising them. By February 2014 the first digital form was published and made available for customers to complete online, print and post to HMRC. Nine months later all 370 forms could be completed this way. A great achievement, but we wanted to make the service even better - to make it completely digital from start to finish with no paper involved at all. So we changed the way we worked. We moved to a standardised way of turning forms into online services – you could call it a ‘forms factory’, but still staying focused on what our customers need. We refined our processes so now services only take 4 – 6 weeks to build, working closely with customers to review and test our design along the way. a feedback facility so our customers can give their input to improve the service. All these improvements mean the forms are quicker and easier to complete and get submitted, with no paper and no postage involved. Plus there’s less room for error, and that means we can process the information and act on it faster. built in a confirmation service that automatically sends a receipt email with a submission reference number and an estimated timescale for a response. automatic processing of some forms using robotics to increase response times back to customers even further. So we’ve gone from 1,600 forms generating lots of paper to 247 forms that can be completed and submitted online with added benefits of quicker processing times, being able to track progress online, and a contribution towards a world-wide reduction in paper use. We've more to do, but I’m really proud of our progress. And if you haven't yet, why not visit your Personal Tax Account and see how much you can already do online? Like to work on one of the globe’s boldest API Models? Matt, it's amazing to see the great progress HMRC has made! However, there is one special form I've been watching with keen interest -- Form 407 (of the Retail Export Scheme). Retailers order these by calling HMRC and waiting 5-10 working days for delivery. A retailer I spoke to recently said last time they called HMRC, they were told the forms had been out of stock for a couple of weeks! Once the retailer does have them, they need to fill one out together with each customer who wants a VAT refund (most tourists ask for it), right after the sale. Finally, the customer takes the form with them to the airport to get it stamped by Customs. Would be great to have a status update on this. Dmitry, some good news. We've just been commissioned to create a digital solution for the Form 407. It won't be available straight away but we're now working on a better, more digital process. Is the back end of the iForms project run via an API? It would be an advantage for agents to be able to create, submit and track forms on behalf of their clients using third party software. We’re working towards developing a robust strategic solution that will enable Agent access, and also provide 'Save & Retrieve', 'Track and Trace' functionality. In the meantime, we'll release a 'minimum viable product' (MVP) later this year that will start to make a selection of i-Forms available to Agents. The strategic solution will also open the door to using ‎APIs. We've been canvassing Agent groups and software providers on what forms would be most desirable as part of our API solution, and will be factoring this in. How does a software developer join any programme for this? We would love to feature many forms in our software. We know there's a high demands so we're planning a way for iforms to be made available to 3rd party software developers for both customers and agents. We'll be looking for interested parties to get involved in the new year and will blog about it here when we reach that stage. So keep in touch. I agree with Caroline. As an agent, given that Your Charter gives people the right to be represented by an agent I cannot understand why, at the design stage, all forms were not designed in such a way that they could be completed by agents on behalf of clients, ready for client review. This was a very obvious omission from the design process and bringing in fixes at a later date is not at all satisfactory. As a taxpayer who completes forms on my own behalf (as well as to help clients) I am enormously frustrated by the number of times I cannot move onto the next page without completing the first fully. This means that I have to keep going away to get information and come back to start again. In-built checks are good but one should still be able to go through the entire form and identify all the missing information in one go rather than one piece at a time. This would make things far less time-consuming and more efficient for your customers. Surely that should also be your aim. We do give information about whats needed upfront, before you start each form, to help you gather everything you need to complete it. If you've come across an instance where we haven’t done this it would be great for us to understand which form it is so we can review and improve the upfront guidance. Please let us know. You would have even greater take up if agents were able to submit forms online on behalf of their clients, in most cases they can't. We agree we need to provide agent access to our forms and we’re currently working on developing a robust strategic solution. This will give Agents the i-form access and functionality they've asked for including 'Save & Retrieve', 'Track and Trace' and a view of the questions that need to be completed. In the meantime, we'll release a 'minimum viable product' (MVP) at the beginning of December, that will start to make a selection of i-Forms available to Agents whilst the fuller, strategic solution is being developed. Are you likely to introduce anything to temp people away from online tax refund services like http://www.uniformtaxrebate.co.uk ? Good question. Yes, we are. We've released communications online, via social media and spoken directly to employers this year to advise customers they can claim refunds directly from HMRC rather than going through rebate companies such as the one you mention. By raising awareness to our customers on what they can do for themselves, coupled with work we’re doing to make it easier and quicker to claim a refund through their personal tax account, we hope more and more people will know to come directly to us.